In fact women and children are the worst sufferers during any natural calamity. A flood-affected housewife Bulbuli (32) of Baniajuri in Manikganj described her sorrows and bitter experience: "Poor women like me have to wait all through the day and night for some food to feed our children. Usually we do not have any money to buy rice and no way to cook food ..." Bulbuli also added that sufferings increases day by day for the helpless women like her do not get enough succour. The bitter truth is that in such distressing situation some of the poor girls/women are enticed by pimps. For those types of important reasons relief and rehabilitation facilities should be prioritised for women and children, specially those so helpless and distressed. Women, who are virtually household based workers have to take responsibilities for protecting their houses, children, other members of the family, livestock and belongings. Traditional gender specific work such as carrying water, cooking, caring for children and animals naturally become too difficult for them during flood. For lack of resources poor women face more problems than women belonging to middle class and rich households. 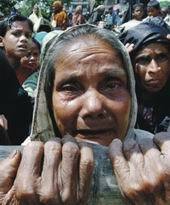 Bangladesh is one of the most disaster prone countries in the world. Only an efficient disaster prevention and management system can reduce human sufferings here. The disabled, elderly people, women and children should get special attention during flood. But the provision of relief and rehabilitation services for them remains poor. Diseases affect people firstly and sometimes as an epidemic, especially diarrhea, pneumonia, jaundice etc. Many people cannot work and earn money. This is why they have to pass the days without food or meal! Due to malnutrition, i. e., for vitamin A, iodine and iron deficiencies children, pregnant women and lactating mothers get eye diseases, xerophthalmia/ night blindness, anemia, goiter etc., which increase the number of visually impaired and disabled people in the country. Women have to face countless difficulties/problems, live inhumanly and struggle to survive even at the cost of one’s life! For example it is not acceptable for a girl of marriageable age to seek shelter in somebody’s house. It is also impossible for women to disregard their inhibitions and go to latrines, which are open to all. Poor women suffer from lack of food, clothing and shelter. Many families/women become homeless. Unemployed men often sat idle or move elsewhere leaving their household members behind. Women, who are the household based workers have to take responsibilities for protecting their houses, children, other members of the family, livestock and belongings. Traditional gender specific work such as carrying water, cooking, caring for children and animals become so difficult, lives at risk for women. Especially while traveling during floods the shari is like a death trap for women. Often there is no alternative because there are no men around to help and even if there are, they do not assist with women’s work because of the powerful ideas of gendered division of labor (Mahbuba Nasreen, 2000). Natural disasters in Bangladesh have a negative impact on child nutrition (HKI, 1998-99). Increase of malnutrition for flood or disaster has enormous costs-misery, pain and ultimately death for the children; economic, social costs for households and stagnation in the long-term development in Bangladesh. Experiences of past years suggest that “mainstream” gender-sensitive projects are the best way to meet women’s needs and improve their socioeconomic status. Projects should be designed to benefit women by enhancing their productivity and earnings. IFPRI mentioned in a document that malnutrition is not a disease rather it is a dangerous process of killing people and destroying future generations of poor countries like Bangladesh. Pregnant women and their fetuses not only need to consume adequate amounts of nutritious food but also need to get access to adequate micronutrients, i.e., vitamins and minerals, which help the body function. Apart from the direct effects on the woman herself, micronutrient malnutrition during pregnancy has serious implications for developing fetus. Iodine deficiency can cause fetal brain damage or stillbirth. Folate deficiency may result in neural tube defects. Iron deficiency anemia and vitamin A deficiency can raise the future infant’s risk of illness, death, impair vision and cognitive development. Most countries failed to achieve the ambitious goal on nutrition set at the 1990 World Summit for Children of halving childhood underweight prevalence by the year 2000. Flood, disaster, poverty, lack of necessary steps etc. are the remarkable causes for the failure to reach that goal in our country. Childhood malnutrition has immediate consequences. Underweight children tend to have more severe episodes of diarrhea and a higher risk of pneumonia. They are also more likely to die. Research has shown that better-nourished girls grow faster before menarche and reach menarche earlier than undernourished girls. Under weight adolescents girls grow for longer and they may not finish growing before their first pregnancy. A still-growing adolescent is likely to give birth to a smaller baby than a mature woman of same nutritional status. Calcium status is a particular concern, as the bones of adolescent girls require calcium for growth. The economic livelihood of populations depends on the health and nutritional well-being. In Bangladesh more than 50% of women are underweight. No economic analysis can fully capture the benefits such as sustained mental, physical and social development. Adequate nutrition is one of the Basic Human Rights for all people and investing at each point in the life cycle will accelerate, consolidate positive change. Floods or disaster carry a high cost, which lead to an increase in both wasting and stunting among preschool children, cause them to fail to grow at a critical point in their mental and physical development. Many children do not recover 15 months after the flood, 40% of children who live in flood-exposed households cannot regain their pre- flood nutritional status. Additionally many poor households are forced in to debt for poverty; as a result they continue to carry enormous debt burdens. Floods, droughts, cyclones, tidal waves and other disasters routinely afflict Bangladesh. Poverty and malnutrition are related to them. Increasing malnutrition for flood or other disaster has enormous economic and social costs for households causing stagnation in the long-term development. Experiences of past years suggest that 'mainstream' gender-sensitive projects are the best way to meet women's needs and improve their socio-economic status. Investing in maternal and childhood nutrition will have both short and long-term benefits of economic and social significance. It would reduce health care costs throughout the life cycle, increase intellectual capacity and adult productivity. Many children do not recover even after 15 months of flood, 40 percent of children who live in flood-exposed households cannot regain their pre-flood nutritional status. At the World Food Summit, 1996 in Italy, countries became agreed that "Food security exists when all people, at all times, have physical and economic access to sufficient safe and nutritious food to meet their dietary needs and food preferences for an active and healthy life style". So, to ensure food security and nutrition of women and children we have to work to meet the needs and flood or disaster should be faced with holistic measures. For the need assessment we can follow the Vulnerability Analysis and Mapping (VAM) system: "Overall damage to dwellings, percentage of households evacuated, percentage of staple food (rice) and cash crop damage, overall damage of farmland, livestock losses, main food staple and cash crops in terms of sown areas and values, family dependence on main staple and cash crop cultivation, rural per capita income and rural per capita level of agricultural production". Failure to adopt proper flood management policy can be considered as one of the major causes of flood distress in Bangladesh. Flood management programmes will be effective only if the main feature of flood pains considered. Any step in flood management should incorporate with indigenous methods, which are used by the rural poor as the ways of improving their chances of survival. It is women who adopt many of those strategies, which are crucial for their household survival (Mahbuba Nasreen, 2000). So, situation demands the involvement and participation of women as policy and decision maker, sharing experiences, in some cases key role players for preventing or management of flood/disasters.